The late Richard Johnson was quoted as describing his role in this film as his best ever. This, his last ever performance filmed when he was 87, it is both highly accomplished and very brave and stretches him as an actor probably more than any other he played in his long career. Leonard (Johnson) and Maria (Jones) are living in isolated retirement in their cottage in Cumbria. Their son Daniel (Cerqueira) receives a call for help from his mother to say that Leonard is refusing to move from the sofa. 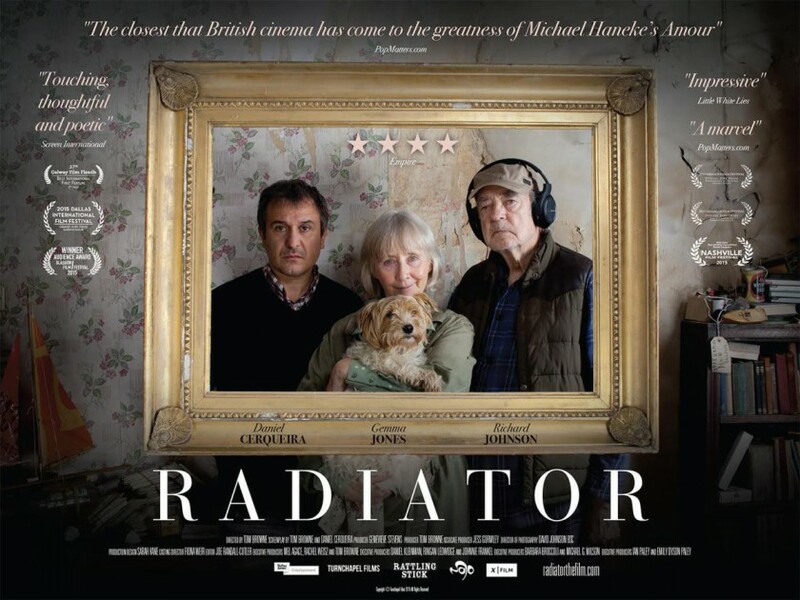 When he arrives Daniel finds his father in a state of semi dementia and his parents living in squalid chaos. As he tries to sort out the situation, the questions of his childhood re-emerge, particularly his adversarial relationship with his father and his puzzlement about his parents’ relationship. Johnson is absolutely superb as Leonard – a strong, intelligent and dominating man, brought low by age and infirmity. He is by turns aggressive, bullying, needy, physically vulnerable and sardonically comic and doesn’t shrink from showing us the humiliations of age, like having to have someone wipe his bottom. There is a wonderfully funny sequence where Daniel is preparing his father’s meal and Leonard insists he must have a particular knife. When Daniel fails to find it, the scene then explodes painfully into one of Leonard’s terrifying rages. Jones as Leonard’s wife matches him with a powerfully poignant and moving depiction of patience and quiet despair, supported by a very unselfish performance from Cerqueira as Daniel. This story is based on director Browne’s relationship with his own parents. He even filmed it to great effect in the actual cottage in which they had lived. Films or indeed novels based directly on the writer’s personal experiences can sometimes be self indulgent and come over more like self therapy as opposed to story telling. None of that in this case though. I suspect one reason for the film’s success in this regard is that Brown wrote the script with his trusted actor friend Cerqueira, who was also going to play the son, which gave it a certain objectivity. The story comes over as totally honest and truthful but with no sentimentality – looking back with a sense of observation and understanding rather than anger. This modest low budget movie packs a punch way above its weight in the way it deals with one of life’s great issues – our parent’s relationship to each other and ours to them – and it would be no surprise to find it getting some posthumous award nominations for Johnson’s dazzling performance. The low budget movie packs a punch way above its weight in the way it deals with one of life’s great issues – our parent’s relationship to each other and ours to them – and it would be no surprise to find it getting some posthumous award nominations for Johnson’s dazzling performance.